Aquabiking. Have you ever heard of it? If not then you’re in for a treat! A popular trend sweeping across Europe and now making its way to the American home front, this game-changing workout is a unique balance of high-yielding exercise and cool relaxation. With awesome benefits that allow you to stay fit, stay rejuvenated and stay on top of your health, aquabiking is the one of the few workouts you can easily be enthusiastic about participating in seven days a week! There is no better way to energize yourself after a relaxing weekend than to take a dip in the pool come Monday morning. Give your wake-up routine an extra boost by using your Wike-Up! aquabike to refresh and revitalize. Aquabiking activates your blood circulation and helps you build up stamina, preparing you for the long week ahead! These are huge benefits! 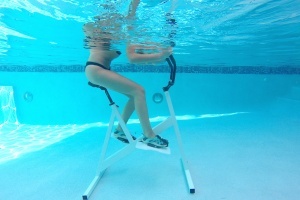 If you have a fitness goal in mind, aquabikes can help you reach it. Having helped thousands tone up their muscles and land their ideal shape, aquabiking is a great alternative to normal exercise routines. Pair your aquabike training with a healthy diet and… well, you’re practically unstoppable. The week is halfway over and your body feels it. Itching for the upcoming Saturday when your alarm is two hours forward, you are reduced to counting down the hours as the days tick by. Count no more. Aquabiking reduces that mid-week fatigue and gives you the push you need to get through the rest of the week. 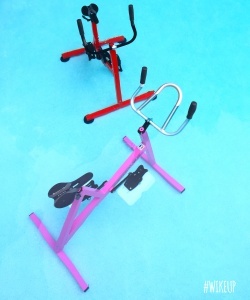 Did you know that the resistance in water is twelve times stronger than that of a normal spinning class? Increase your flexibility, speed and balance with this exciting water sport and stay in the best shape of your life! By Friday most of us are exhausted. The muscles in your shoulders are stiff from sitting at a desk all week and your neck is tight. However, we still want to be able to go out on the weekend and enjoy our free time. Along with decreasing your anxiety and increasing your confidence, aquabiking helps relieve your body of dreaded muscle tension. So why not take out your Wike-Up! aquabike and hit the water before squeezing your toes into those clubbing shoes? Your cardiovascular system is responsible for carrying out some of the most essential activities within your body. Wike-Up! aquabikes improve this process by reducing the amount of breaths you take during your exercise, lowering your heart rate and putting less stress on your body, blowing traditional biking out of the water. Athletes and personal trainers alike are more likely to suffer from many injuries during their life than the everyday person. 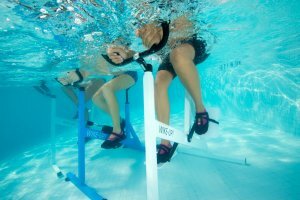 With low-impact and less pressure on your joints, aquabikes has created a way to make rehabilitation for athletes easy and enjoyable. Just ask pro-BMX biker, Romain Taupier, about its benefits. Wike-Up! aquabikes come in a variety of colors and can range from high to low impact. They can be easily transported and used by professionals and amateurs alike. Reach out to our talented team for more information about Wike-Up! Or to learn more about the Wike-Up! aquabikes available on the market, visit our shop or visit our showroom at 1776 Sans Souci Boulevard, North Miami, FL 33181. Thank you for your interest in Wike-Up!Aquabikes.